Have you ever had the feeling that you’ve finally figured everything out? And then… something happens and you realize – nope. You never had it figured out in the first place. Like daycare. Daycare was a struggle. Staying on top of the fees, bringing in clothes, diapers, supplies, whatever the kids needed. You probably think I’m a big whiner when I say that, but hear me out: I was a new mommy, a single mommy, a working mommy. It was tough getting all my stuff together. I actually remember the moment when it all clicked. I was standing in the principal’s office chatting with her. I’d had kids there for maybe four years, and seen her almost every day since then. It’s like what they say about marriage, right? Sickness, health, good times, bad times, phone calls about money, phone calls about… I don’t know, other stuff. And I realized there were no outstanding bills, the kids had all they need, I knew their teacher’s names, everyone was healthy and our routine ticked like clockwork. I’d stuck with it and matured, grown up into a mama who was not just okay at the daycare routine – I totally ROCKED the daycare routine. And then Elisheva Chaya graduated. Daycare over… check. Elementary school… ditto. First one school, then another, learning the ropes, figuring out through trial and error how to interact with the teachers, how to get what the kids needed, how to help out in various useful volunteery ways, how to chat with the other parents during pickups and dropoffs. It was all finally going so smoothly until one day… we were done with elementary school. And then high school, more trial and error… mostly error. Not asking the questions, not having the stuff they needed, the books and uniforms and pencils all pointy, lined up in a row, not being prepared enough for parent-teacher interviews (forgetting which teacher taught what…). A moment too late, or perhaps a couple of years or more, it occurs to me that I ought to have done more about the big kids’ university Things. What would I have done? What could I have done? No clue. How the Top Ten Jewish kids’ books are hurting Jewish kids. Remember that Paperclips movie a few years ago? There’s a book out about it now, too. The movie made me angry, and tonight I’m angry again, for almost the same reason. Am I the only one? When the principal of Whitwell Middle School sought a program that would teach diversity to a predominantly white, Protestant student body, the notion of focusing on the Holocaust--specifically Hitler's extermination of six million Jews--seemed like an obvious way to go. Seriously??? If you’re trying to teach diversity to kids who have never met a Jew, you teach the Holocaust? That makes as much sense as using slavery as the core of a curriculum about African pride, history and culture. Or smallpox as a way of teaching about native Americans. See why my brain is steaming out my ears just thinking about this movie? Do I really want the only thing kids in Mississippi to learn about my ancient faith is that six million of us were killed? Sheesh. That’s why the paperclips movie made me mad, even though everybody else was gushing all over about how wonderful it was at the time. Well-meaning or not, the Holocaust should not be the core of a diversity curriculum. Diversity should focus on Judaism as it’s LIVED, not as it’s died. Which is why I was appalled tonight when I took a look at Amazon's Top 10 list of Jewish kids’ books. Amazon updates its lists hourly, so this is totally subject to change at any second. But these results are not atypical. Ashley Martin: A heartbreak… a disaster… a homebirth…? Still, I wonder if this is really about homebirth at all. Birth, as normal as it is, and as much as we must trust the process and let our bodies do the work of labouring, is a difficult and – yes – a dangerous time. Nobody should ever tell a mother anything else, and my heart weeps that everyone told Ashley that by empowering herself, she could guarantee a glowing, harmonious birth experience. The thing is… birth is dangerous no matter where you do it. How many babies have died in hospital births? An uncountable number (and every one, an unacceptable loss). Beyond that, how many near-misses – how many babies whose births were mismanaged in hospitals? How many babies have been infected while in the hospital, and how many more will be in the next few years with rising rates of uncontrollable bacteria? Maybe lots and lots of those babies turned out okay… but, in Ashley’s words, does that mean their hospital births “were not okay”? Blogging has become disgustingly analytical these days. If I wanted, I could spend all day gazing at my proverbial naval, looking at statistics, and finding out along the way exactly who you are and what you like and creating content you’ll love. Luckily for you (unluckily for my pocketbook), I’m too cynical for all of that. But I do check my Amazon reports every month to find out who’s clicking on the links I share, and what you’re buying. That’s because I get a teeny-tiny kickback from Amazon every time you click through. What do I do with the money? Sometimes, I buy ebooks, which have become incredibly important since we moved thousands of kilometres away from our favourite library. And sometimes, if I have enough piled up to buy an actual book, then I buy copies to send reviewers, though sometimes that ends badly. It isn’t big money, hardly even real money, but it is something, and sometimes, it comes in handy. You should know right off the bat: I can’t tell who buys what. So. Ahem. We have had… the conversation. A couple of weeks ago, at our favourite used book store in Tel Aviv (Halper’s), Naomi Rivka picked up a copy of Judy Blume’s classic, Are You there God? 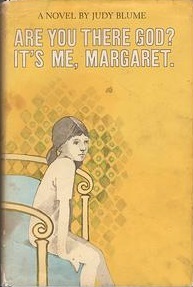 It’s Me, Margaret. This is actually the cover – I think it’s a very early edition. At first, reading the back-cover blurb, I couldn’t figure out what was more disturbing about the book – its famous mention of menstruation (many girls’ first) or its detailed description of Margaret’s complicated religious situation.